From what I know of Isabella, she is one hellaciously busy woman! Isabella is another author I follow on Facebook. (I’m not a stalker, really!) She always has something going on! Sometimes, I get tired just thinking about it. I was at the conference Isabella writes about here. I remember her very well. I didn’t get to meet her, though. It was Mom’s first “full” conference and all of my free time went to making sure she was having a good time. But I remember Isabella – tall, great smile, looks awesome in a tie. 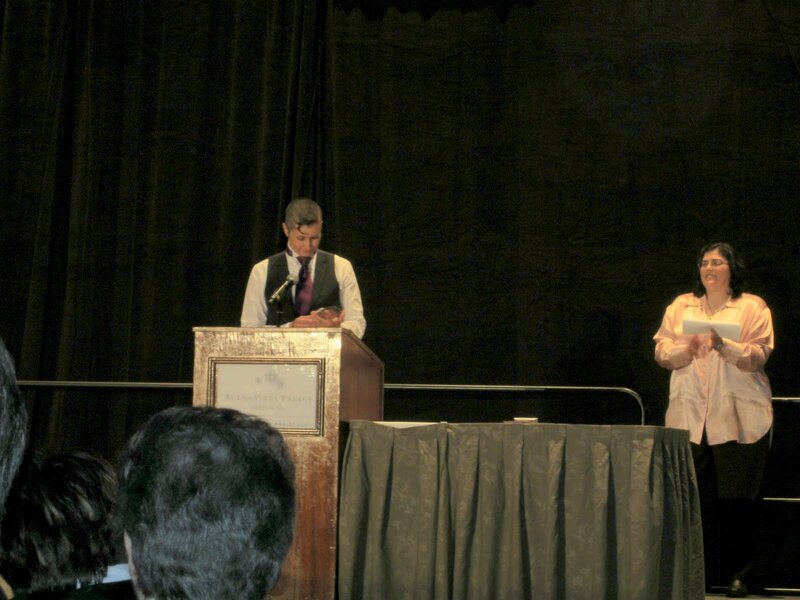 I was on the podium as a presenter when she won her award and I remember just how excited she was about it. She was just vibrating when she came up to accept the award. But what was really memorable was how calm and present she was while giving her acceptance speech. It was very cool. The lighting was perfect, dinner was nice and the evening started just right. It was special. “Road trip,” I whispered to my wife. “What? Road trip where?” she said suspiciously. I could see she was skeptical about my ability to stay calm for five days. A trip to Florida would take that long, right? I did the math. It was just as expensive to fly as drive. We’d be taking books, flyers, luggage. We’d be bringing back more books, (did I mention I love to read?) more clothes, (did I mention she loves to shop?) and who knew what else. “We can stop and see Connie,” I whispered, filling her glass again. This was going to take some work and my best moves. I slid closer and whispered. “Besides, they have Disneyworld.” I wiggled my eyebrows. And so it began, the negotiation for my first GCLS conference. Little did I know that my first GCLS conference would feel like the first day at high school. You know that feeling, you don’t know anyone, you walk on campus and the BWOC are walking around, a few women following them, chatting them up. I checked in, got my badge and a program and sat down waiting for the one person who I had contact with before the conference. Women walked past me, looked at me trying to figure out who I was. Was I an author, a reader, or part of the funeral group that had the rooms down the hall. Okay, I have to admit, it was creepy walking past that every day. I couldn’t help myself, so I peeked in. Hearses, urns, coffins and other adornments for death lined the walls and were neatly displayed throughout the room. Again, creepy. More women walked past me, looked at me and moved on. Lesbians, definitely lesbians. Cargo shorts, T-shirts and name badges hanging around their necks, out of their pockets, and…well you get the idea. Being an hour-and-a-half early gave me lots of time to think about what I was doing in Orlando. What was this thing called, GCLS? Who are these women walking past me? Do those flip-flops go with those shorts? Where’s the bathroom? Why does my room smell moldy? I’d lived in Alabama for three years so the weather was always a topic for conversation so I was use to that, but does one ever really get use to the humidity? Questions, questions, questions? Finally, my contact person arrived. How did I know it was her? She had her own entourage and gear. A lot of gear and energy. “Hey, you Isabella?” She came over carrying a clear container. “Yep, you Beth?” I said taking the container. I had offered to help fill goodie bags in exchange for stuffing my own swag inside and book placement on the table she was sharing with others. “Damn, you’re tall. Nice boots,” she said looking down at my cowboy boots. I shrugged my shoulders. I had no idea how these things were run, but I was sure I’d get a quick lesson on lesbian conference – 101 and Beth would be the teacher. “So, who’ve you seen?” She said bouncing between plastic containers. “I have no idea?” I hadn’t recognized anyone, yet. I knew a few authors, but most of those wouldn’t be at this conference. True to her word, Beth introduced me to the two women who had come with her. Lovely ladies and that was as far as I got. She was a floating butterfly, lighting occasionally to talk to women who walked by. The same women who walked by, looked at me and then shrugged their shoulders. Yep, this was like high school all over again. When I went back to my room, I knew what my wife would say the minute I opened the door. The smirk I shot my wife answered her question. “Do you remember the first day of high school?” I said. That night in the hot tub, we met a few lovely women connected with the GCLS. One who hated Palmeto bugs, you know – those flying cockroaches, so much so, that she screamed bloody murder when one flew at her. Squished it dead, as I remember. And that my friend, was how my GCLS experience started. Our trip home was even eventful. We were stopped in Arizona on our way home. Seems a trooper thought we might be running drugs. When I told him he was free to inspect our luggage. “Hey, you’d be surprised.” He slapped his hands together and rushed to his car. 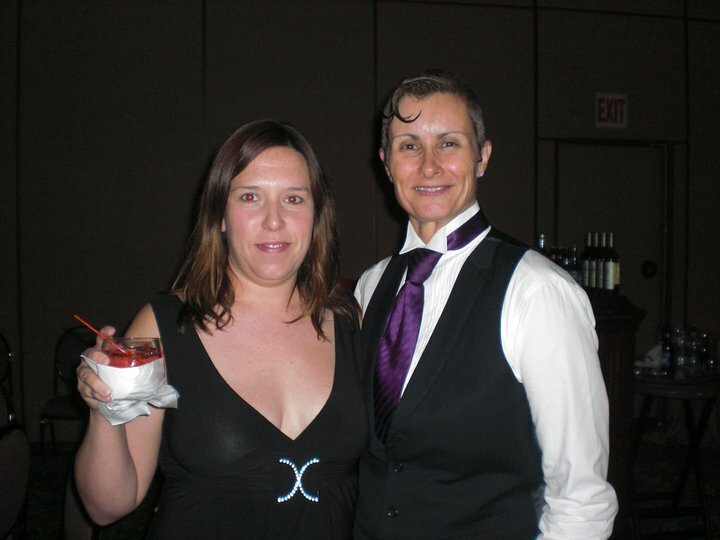 Oh, did I happen to mention I won an award that year at GCLS? Yep, shocked me too, if they don’t ask for it back, I’m keeping it. I even made a few friends, got to meet and chat with the author of the first lesbian stories I ever read, and survived my road trip to Orlando. What, there’s another GCLS conference in Dallas? Did I hear someone say, road trip!!!!! Award-winning author Isabella lives in California with her wife and three sons. Isabella’s first novel, Always Faithful, won a Golden Crown Literary Society Award in the traditional contemporary romance category. She was also a finalist in the International Book Awards, and she received an honorable mention in the 2010 Rainbow Awards. She is a member of the Rainbow Romance Writers, Romance Writers of America, and the Golden Crown Literary Society. She has written several short stories and just finished her next novel, Executive Disclosure, which was published in December, 2012. You can also find her books on iTunes, Amazon, Barnes & Noble, Smashwords, Kobo, Sony, and All Romance Ebooks. Honey, everyone was looking at you — and your wife — trying to figure out who the incredibly good looking people were! Thanks Jaynes, you’re sweet to say that. It’s the first time we meet, too. See you in Dallas. Well Dallas isn’t as far as Orlando so there’s that. Lookout for that trooper! He might just decide to check out the luggage and take some souvenirs. Some day I’ll tell you about the time I was cuff and put in a cop car in Texas. So, I’m sure it will be another adventure to Texas. So, if he finds something in the luggage he can have it.